Sharing global nomad experiences with my friends. Bangladesh - Visiting "Before All the Tourists Come"
It was at the entrance to Petra, Jordan that I first became aware of the New7Wonders.com effort to have world popularity contest for the seven wonders. They were announced last month. Peru, of course, was elated that Machu Picchu made the list and was leveraging it for their growing tourism industry, although it did spark a strike in the tourist hub city of Cuzco the week before I arrived. Apparently the civil servants and other workers felt the election should lead to an immediate pay raise. I disagree with some of the winners and have to assume that the internet savvy country of Brazil coordinated a surge in voting for the Christ Redeemer statue in Rio. While certainly beautiful, I do not think it deserved a spot over some other places. So I decided I should post my own opinion of the new. seven wonders of the world in this blog entry. You will see there is a preponderance of ancient stone structures on my list. I guess I have a bias for ancient cultures' abilties to create stone structures without modern machinery. My rules are that the place must have been man made (therefore no waterfalls or animal migrations) and I must have seen them personally. My first would be the 1000 year old temples of Angkor Wat, Cambodia. The fact that my number one pick wasn't even on the new winner's list (and the Rio relatively modern statue was) ultimately preciptated this blog entry. I was there in 1999 with my friend Adam. I still think it is one of the most amazing sites I have ever seen. I hear it is overbuilt with expensive hotels now, but you can't really blame the poor Cambodians from leveraging their one major tourist attraction after all they have suffered. Of course, the Cambodians weren't internet saavy enough to win a spot. Nevertheless, definitely add this to your list of places to see. Moreover, if you are ever in Bangkok, take the 45 min flight and two days to see it. Not doing so would be like flying from Bangkok to Hartford, Connecticut and not bothering to visit NYC for the first time. Other good Karma note, Adam went back to Angkor Wat for his honeymoon. During his three days there the tsunami struck and wiped out the hotel he and his wife had reservations for a couple days later, killing many of the guests. So seeing Angkor Wat might change the trajectory of your life in a positive way. The Great Pyramids of Giza. The Egyptians (wisely) refused to partake in this popularity contest rightfully claiming that they were the only remaining wonder from the ancient seven wonders. Cairo's sprawl might creep right up the base of the pryamids and the sphinx is definitely underwealming. But the pryamids are impressive up close. The rock hewn churches of Lalibela, Ethiopian are my next choice. Again, the Ethiopians didn't even get this site on the list of 20 choices, which is a shame. It was seeing pictures of these churches several years ago that prompted me to go to Africa on my sabbatical, and they didn't disappoint. Basically King Lalibela in the 11th century (coincidentally contemporary with the building of Angkor Wat) carved eleven churches DOWN into the rock. They were really beautiful and impressive. Machu picchu and the Inca Trail. I write about these in my entry below. This lost city and the other Inca structures in the area are impressive. They are even more beautiful surrounded by the spectacular Andes Mountains. Petra, Jordan is another that I can agree with. The approach to the Treasury Building through the Souq only heightens your anticipation. Hiking around the ruins you can't help but feel a bit like Indian Jones. The Great Wall of China - I hear that even the sections near Beijing that were untouristed back when I visited in 1999 are now very touristy. Then again, I am sure many places are still quite remote. Definitely hike up to and along the wall. On seeing the wall in 1999 I was reminded of Richard Nixon's proclaimation during his visit, "This really is a great wall!" The pagodas of Bagan, Burma - What the 2000 pagodas sprinkled across the sienna colored countryside may lack in individual mass, they make up for it in volume. I am no fan of the oppressive government of Burma, which may be why these were not on the candidate's list of the popularity contest. After all, who wants that morally corrupt dictatorship to win any contest? Nevertheless, the view of all the pagodas at sunrise or sunset was breath taking. I also loved the people I met in Burma and would encourage a visit there so long as you go as a backpacker. Any organzed tour puts too much money in the pockets of the cruel dictators. Burma is a time capsle and incredibly cheap. In 2000 I spent 28 days there and spent $360 total. Jerusalem's Old City - I found Jerusalem to be mesmerizing. There is so much history there regardless of your religious or political leanings. Sydney's harbour - Sydney is my favorite modern city in the world. The Aussies know how to live life. I spent the Millenium New Year here and remember it fondly. Being in the IT industry, I find it funny now that we were convinced we would hear of all the Y2K disasters unfold as we were at the start of the millennium. The flight here is not as bad as you think. Go. Pryamids of Mexico - there is something spiritual about this place. If you are ever in Mexico City, definitely visit these pyramids. Petola Palace in Llasa, Tibet - this is also a spiritual place, although I am sure it is changing. The Dalai Lama's former palace sits perched on the hill overlooking the city. You can't help but be impressed, even with all the modern white tile and blue glass Chinese building littering the city now. Kyoto, Japan - Japan has a rich history and Kyoto is its hub. The wooden temples that have survived earthquakes for hundreds of years are mellowing and inspiring. I understand the former US ambassador's wife saved Kyoto from being a target of one of the two nuclear bombs dropped on Japan. When you are in Japan do go to Hiroshima and learn first hand how awful nuclear war could be. Feel free to use the comment feature of this blog to add your choices or opinions. I enjoyed Peru more than expected, mainly because of how impressed I was with the Peruvians of both today and of old. The Peruvians I met were very nice. My sister recently claimed that whenever I come back from a new country I say the people were very nice. While I do tend to find most people to be friendly, I will say that I have not, in fact, found every country's people to be nice. I won't bash any country here in writing (ask me in person). Suffice it to say that the Peruvians are genuinely kind (like the Mongolians). I certainly felt for those kind Peruvians suffering from the earthquake that struck three days after we left. I will say that they tourist infrastructure also seemed prepared (or at least aware) of their seismic risks as most hotels we stayed in had a sign saying "Stand here in case of an earthquake". What really struck me (so to speak) about Peru though, was just how advanced the Inca empire was when the Spanish conquistadors showed up in 1532. Of course, the European political and religious leaders of the 16th century couldn't admit that there was such an advanced (non-Christian) culture and society in the New World. Since history is written by the victors, I think I must have received a biased education over the years. The Peruvians seemed to be increasingly proud of their Quechua and Inca past, which was great to see. I enjoyed seeing first hand and learning from them the accomplishments of their pre-Columbian culture. Of course, the Incas figured something out about construction in a seismic zone. We still could learn from their techniques. The 600+ year old Inca structures still stand, while the post-colonial and modern structures collapse and do the most harm. The impetus for Eliza's and my 2.5 week trip was an opportunity to co-lead the Yale Alumni Association's adventure tip to hike the Inca Trail to Machu Picchu. My business school friend, Nancy, founded an adventure company which was Yale's partner on the trip. Last year in Africa I co-lead two trips for Nancy for National Geographic Expeditions in Tanzania, so I was pleased to be given the opportunity to work with her company again and to hike the Inca Trail to Machu Picchu for the first time. I enjoyed leading this trip tremendously. Like the others, it was the clients I enjoyed the most. And that is saying a lot because the Andes Mountains, Inca Trail, and Machu Picchu are quite spectacular! I am convinced that Peru will grow as a tourist destination so long as the country continues to remain stable. Currently you can't help but be impressed with their movement towards democracy and economic growth. Certainly the country has challenges as any developing country does. But where stability reigns, tourists tend to follow, especially when the country has one of the New Seven Wonders of the world with the lost city of the Incas. Machu Picchu is more of a culmination of a series of pretty spectacular native ruins. The Inca Trail itself is a portion of an impressive system of roads the Inca's built to connect their empire from Tucuman, Argentina (where I was a high school exchange student) to modern day Columbia. The Inca capital of Cuzco has some incredible structures designed to impress the leaders and people of conquered tribes. And along the Inca trail we passed several Inca structures and cities. From all of them it was clear that the Incas built upon the knowledge of the local cultures that preceded them to organize impressive cities. The Incas were also clearly expert agronomists. They had agricultural research centers and mastered ways to farm the little arable land that exists in this mountainous and desert land. I read a good book called "Indian Givers" by an anthropologist named Weatherford. He made me realize just how much we gained from the new world. Peru is the home of the potato; in fact they grow over 4000 kinds! We also got the tomato, chili pepper and corn from the New World. Can you imagine what Italian food must have been like before the tomato? I found myself well fed in Peru, although I did get sick twice there. Once at Lake Titikaka (how could I, a fan of Bevis & Butthead, skip Lake Titikaka) and another at the end of the Inca Trail while touring the Machu Picchu ruins. So I advise future tourists to be very careful with all water and food as I normally have a pretty iron clad travel stomach and did not get sick once in 7 months of travel throughout Africa. I have posted a couple dozen of my favorite photos in an album on this blog, so feel free to check out that album. In a way this was a way to wean myself off of my sabbatical as I began a job at a start-up upon my return. It is a small company founded by my former CEO to deliver high definition video on demand content. His asking me to head up North American sales was too good to pass up. I can explain it more in person. Like most start-ups there is more to it than you will likely gleen from the web site (www.ONnetworks.com). Feel free to check out some of the professionally sourced content for yourself (i.e. not user generated videos of cats falling off dressers). I didn't really know what to expect of Mongolia. All I knew was that the invitation to go was too good to pass up. Nancy, my friend from business school who founded an adventure travel company called Global Adrenaline, was going on an exploratory trip to Mongolia and invited several friends to come along. I worked for Nancy in Tanzania co-leading safaris she manages for National Geographic Expeditions. Her clients expect her to suggest new trip ideas, and she was going to test out a potential new partner in Mongolia. I had decided to do independent consulting upon my return from my sabbatical in order to have the flexibility to travel, so why not taker her up on her invitation to join her group of friends on this exploratory trip? What I discovered is a beautiful land of extremes. Mongolia is the least populated country in the world, which made it quite a contrast to the last country I had just visited, Bangladesh. Over 1 million of the 2.5 M Mongolians live in the capital, Ulan Bataar. The remaining are sparsely sprinkled across a large country also known as Outer Mongolia. Ulan Bataar was interesting, but nothing to write home about, unless you love cashmere sweaters at 75% off what you would pay in the US (I came home with six). Mongolia was under the Soviet influence for almost 70 years. Since its independence in 1990, the friendly Mongolians have been working to establish a capitalist democracy while cherishing the land they inherently love as a nomadic culture. From what I could see and read, they are succeeding. I imagine Ulan Bataar is bitterly cold in the winter, so it doesn't have much green space. So it is really a large city full of crumbling Soviet architecture covered in banners of new capitalist businesses with a spattering of ugly Chinese modern architecture. Mongolia is in about as difficult a place as you'd would ever want your country to be. Its small population only has two neighbors - Russia (Siberia) to the north and China (the Inner Mongolia portion) to the south. This means if the Mongolians piss off the Russians, they could decide to just turn off Mongolia's energy source (ala Ukraine). Similarly, when the Mongolians (who are rediscovering their Tibetan Buddhism roots after 7 decades of Soviet ban on religion) invited the Dalai Lama to visit, the Chinese decided they would close all railroads 'for maintenance'. This effectively shuts off all trade for Mongolia. Yet somehow these kind people of Mongolia find their way and seem to get along fine. Unfortunately the pressure to mine the Mongolian countryside for copper and other mineral deposits to feed the Chinese economy is hard for this new capitalist country to resist and definitely could strain their fragile countryside. We started our trip by flying north to Lake Hovsgol, just 100km south of the Siberian border. Lake Hovsgol is one of the largest fresh water lakes and contains 1% of the world's non-frozen fresh water. It drains into Russia's Lake Baikal, which holds an amazing 20% of the world's non-frozen fresh water. Lake Hovsgol also has the world's largest fresh water fish, a whopping 4 foot trout! Most western tourists practice catch-and-release (including a recent visit by Justice Sandra Day O'Connor, who is an avid angler…who would have know?). Most Russians apparently practice catch-and-eat, so there is a bit of eco-tourism education that still must go on in Russia, I feel. I didn't see any of these huge fish, other than in photos, but I could have if they swam nearby as the lake was crystal clear. We camped along the shores and were treated to the beautiful Siberian forest. We also kayaked in a bay, which I really enjoyed. I didn't so much enjoy the horse trekking to get there. I must say that despite being a Texan, I've never really enjoyed horseback riding. I can't say the few hours on the short Mongolian saddle (that gave me a blister in a place I've never had a blister before) really improved my opinion of horseback riding. Nevertheless, I appreciated why the Mongolians adore their horses. There are apparently 13 horses for every human in Mongolia. Horses are clearly the easiest way to get around. The trip was titled, "Yak to Kayak". I can say that these yaks did haul our kayaks to the camp, so the trip lived up to its billing. Mongolians are and have always been nomads. It was really nice to get a peek into the lives of the horse wranglers who live a traditional nomadic life. All land is communal, so when the weather or grazing demands it, they pick up and move with all their livestock. Like most nomads, the Mongolians consider their sheep, cashmere goats, horses, yaks and reindeer as their walking savings accounts. When we visited in June, the families were starting to fatten up their livestock thinned from the long and harsh Siberian winter. When the winter is particularly harsh, their livestock dies. Too often, their nomadic lifestyle dies with their livestock/savings account and forces many families to move into urban areas like Ulan Bataar. Maybe that was why I saw so many gers (or yurts) in the cities. Although I was told that even when a middle class family builds a traditional brick house, they still pitch a ger in their backyard as the ger is central to the Mongolian lifestyle. We stayed in several gers on the trip, mostly at ecolodges. They are really quite functional and purpose built. They can be easily taken down, transported and rebuilt. All the parts can be found or made by nomads (wood, sheep wool's felt). The latest addition is solar charged and battery powered satellite dishes. Practically speaking they are essential to help the nomads get the latest weather reports to know when and where to move with the seasons to keep their livestock fed. They also apparently love the soap operas. From the cold and wet (even in June) north we flew south to the Gobi Desert. I found it funny to learn that "Gobi" means desert. So we essentially went to the Desert Desert. I really loved the Gobi. It was hard to believe that such a different extreme from the Siberian conifer forests existed just to the south. The Gobi is hot and dry. Only 3% of the Gobi is covered in sand dunes, so it isn't sandy like Namibia (the 2nd least populated country in the world). In fact when I looked closely to the ground, I saw sparse, thin, green vegetation. It is this that the hardy sheep, goats and camels survive on. As a result, when you looked across the Gobi from a hill top, you'd see the white gers spread way apart. Each family needs a lot of Gobi land to feed its livestock. I the Gobi we rode the two-humped Bactrian camels for a few hours. I actually much preferred these to the horses. Oddly, the women travelers on the trip found the camels uncomfortable while the men found the horses uncomfortable. So I have to assume there is some sort of physiological explanation. The photos of the furry camels in the winter were majestic. The mangy camels after shedding their coats for the summer were hardly majestic. But they were quite funny. The best part of the ride was the great lunch our guides had prepared on a well laid table in the middle of the Gobi. We also did some mountain biking in the Gobi, which I also loved. I was pleasantly surprised that our awesome 3 Camels Lodge had bicycles. As we rode around the desert, we'd occasionally see skulls and bones of horses and camels. One of the clients, Elizabeth, was a vet specializing in equine dentistry. So she could diagnose the skulls and tell us just how old the horse was when it died. In the dinosaur museum she also could show us characteristics of the extinct dinosaur's teeth, which was pretty interesting. Mongolia is famous for all the dinosaur bones that were discovered there. We visited the flaming cliffs where the fossil of two dog sized dinosaurs captured while fighting was found. We saw that impressive fossil in the museum as well. I didn't realize that the Chinese legend of dragons originated with the dinosaur fossils from the Mongolian deserts. It makes sense once it is pointed out to you. Ground up dragon bones for Chinese medicine were effectively fossilized dinosaur bones, apparently. While traveling outside of Ulan Bataar, three guys and I made a spur of the moment golf outing at the Chinggis Khan Country Club. The Mongolians are quite proud of Genghis Khan (which they spell as Chinggis) and rightfully so. Eight hundred and one years ago Genghis Khan founded the largest empire to date. His army was about to attack Vienna, Austria when he died and his generals were summoned back to Ulan Bataar to vote on his successor. Alas, as the Chinese told him at the time, "An empire conquered on horseback cannot be ruled on horseback." There probably is a lesson to be learned there by our current administration. As Mongolia is in the "Coalition of the Willing", perhaps our generals will listen to the Mongolians on the lessons learned eight centuries ago. But I digress... Our spur of the moment golf outing was really quite fun. For a mere $53 we got greens fees, clubs, balls, and a nice caddy who actually ensured I never lost a golf ball (a first for this golfer). We enjoyed ourselves more than we expected. Most importantly, we each knew the next time we went golfing we could say, "The last time I was golfing, in Mongolia..."
I am convinced you will be hearing more and more about Mongolia as a travel destination in the near future. If you ever have the opportunity to go, I strongly encourage you to do so. Ulan Bataar and Lake Baikal, Siberia are both stops on the Trans Siberian Railroad. If you ever take it, which is now on my list of trips to take someday, I encourage you to stop and enjoy the Mongolian scenery and lovely people. As I was on an around the world ticket already, my next stop was to visit my friends Randy and Anne in Dhaka, Bangladesh. Randy and I were roommates and work colleagues in DC and Bern, where Anne, his now wife, also worked. The three of us traveled together in Australia and New Zealand for several weeks on my previous sabbatical in 1999. When they got posted at the US embassy in Dhaka, they said Eliza and I would be the first to visit. (Randy's other claim to fame is that he introduced me to Eliza.) Unfortunately Eliza couldn't join me on my short weekend visit to Dhaka, although she would have loved to. Randy and Anne were great hosts. I wasn't their first visitor as Anne's sister came after their adorable son, Sam, was born. I swear Sam is the happiest 6 month old I have ever met. He smiled 80% of the time and only cried 90 seconds in the four days I was there. I had a moving experience getting a private tour at the ICDDRB cholera hospital. They save so many adults and children every day from dying from diarrhea. I saw them teach poor women nutrition so that their malnourished children could survive a second or third bout with the inevitable disease. The operation and staff were impressive and inspiring. Anne and I had a funny experience when she took me to the port to see the ferry terminal. Bangladesh is the most densely populated (non-island) country in the world. Anne said it is like cramming half the population of the US into a country the size of Wisconsin, a third of which is under water. Needless to say, many people get around my ferry. The hectic port exposed a lot of the country's poverty but also their hustle. To see it properly, you have to get up to the top of a three story ferry. So Anne and I naturally picked the completely empty ferry to board assuming it wasn't going anywhere. From the top we saw goats and vegetables being unloaded into flat boats all floating in a chocolate brown port water that you wouldn't want to fall into. Just after taking this photo, my 'spider sense' went off. I turned to Anne and said, "I think we should get off this boat". It felt like it started up, but we also suspected the vibrations were from the noisy boat pulling in next to us. We started walking downstairs only to notice that the boat was pulling away! We quickly hopped onto one of the flat cargo rowboats on the side (undoubtedly its owner saw our predicament and knew a relatively large Western tip would be forthcoming e.g. $1). He hussled us over to the neighboring packed boat which obviously wasn't going anywhere as why else would it be packed with people?! We got back on tierra firma and had a good laugh. We would have kissed the ground, but that would have surely landed us in the cholera hospital. The other really fun adventure we had was a private afternoon boat trip on a river outside of Dhaka. It was sort of a timeshare boat some expats co-own, so it was quite lovely and relaxing. We watched the world go by greeted by the friendly Bangladeshi rice farmers and men on boats. At the end of the trip I got to the car last. When I walked up to the car, there was a crowd of villagers around it. I could see Randy and Anne's heads poking above the relatively shorter locals. The commotion was generated by two of our partners in crime for the outing - Sam and Stella the pug! Stella is just a force in personality and probably entertained the whole village while we were on the boat. Their driver babysat Stella while we were on the boat (trust me, you wouldn't want to drive yourself in chaotic Dhaka traffic). Sam just sat their smiling making friends with a local boy his age. That kid is a born diplomat and certainly inherited his parents' kind disposition and love for adventure. This actually was my second time to Bangladesh. I encourage you to visit "Before the Tourists Come" as this tourism poster proclaimed. I don't think you will find as gracious hosts as Randy and Anne. But you will certainly find adventure! One backpacker commented to me in Africa, "the more you travel, the more you want to see." Accordingly I believe I have simply been weaning myself off my sabattical since I returned last January. I decided to hang a shingle to do some independent consulting in order to have the flexibility to tarvel at least for a few months while I figured out what I wanted to do longer term. Fortunately my old boss connected me with an opportunity to work for one of my ex-employers helping them find alliance aprtners worldwide for a new software product in the mobility space. Part of the appeal of the project was that it would require me to take a trip to Europe and Asia. As it worked out, I was able to do a two week around the world trip in May. The business meetings went well, and along the way I was able to visit with friends and see some sights. I lived in Switzerland ten years ago and love every chance I have to visit that beautiful country. Two of my great friends, Peter and Heike actually met at my 25th birthday, so I couldn't miss the opportunity to meet their second son for the first time. You see, I feel a bit responsible for their children feeling they might have never met had Heike not come with her friend, Sabine, to see the Moscow circus in Dusseldorf on Feb 18, 1994. The rest is history. The views of the Alps across Lake Geneva from their beautiful home are also a strong enticement to visit. Those views and the Swiss order are in stark contrast to the streets of New Delhi, where I flew next. I had spent 6 weeks backpacking in Northeastern India in 2000 but had never been to Delhi. I actually liked the city and was impressed with how much growth had occurred in seven years in India. Of course the infrastructure hasn't kept up, making for strange juxtoposition of fancy malls with brand name stores with muddy streets and chaos just outside the doors. I really enjoyed the dinners I had with b-school classmate of mine in New Delhi. There I also discovered this weird Upper East Side expat community meets Delhi in Vegas style oppulance. It didn't appeal to me as a 'scene', but was interesting to witness several young Americans and Brits being what I considered pretentious in Delhi. I guess it was sort of a modern day "highly skilled world-is-flat gold rush" of some sort. I fortunately had two free days, so I decided I must go see the Taj Mahal. The best option was the all day excursion with a 4-5 hour drive each way. I've learned over the years to actually enjoy drives through foreign lands as a great way to see and experience the country. And I must say the drive from Delhi to Agra was anything but boring! I piled into a nice modern mini-van with a German woman, a quiet Swede, and an odd Chinese American from the CDC who didn't quite get how India worked. It was hotter than Hades outside, but I learned never to travel on a bus without my fleece. Sure enough, the driver insisted on cranking up the AC. I tell you, if we want to cut CO2 ommissions in Asia, start a campaign making it hip to not have their AC set to 'Arctic'. Along the way I came up with a new video game called "Delhi Taxi Driver". The goal is to dodge the rickshaws, people, cars, buses, trucks, and cows that dart out in front of you. While certainly a few horn honks were necessary to avoid catastrophy, the cumulative time the horn was engaged was certainly excessive. At one point I turned to the German procurement officer and said, "He honks more in one hour than I do all month". To which she replied, "He has honked more in four hours than I have my entire life". She was right. The journey was enjoyable and worth it. Even though we nearly melted in the 100+ degree May sun in Uttar Pradesh, the Taj Mahal was beautiful. I found it to be smaller than I imagined from the photos. The really beauty to me was the intricate inlaid stone work inside the tomb. Of course there is no photography allowed inside, so you will have to get the idea from the less detailed exterior inlaid stone work in this photo. I was glad I saw the Taj Mahal. Some Spanish backpackers I met in Petra Jordan said the Taj Mahal was as impressive as Petra. I would respectfully disagree. I would go back to Petra, although I don't think I would need to make a return trip to the Taj Mahal. Before I get a ton of comments telling me I am crazy, I guess I will say I am more easily impressed by works of architecture where I can't imagine how they built it without modern day equipment. That's why I am in awe of Anghor Wat Cambodia, Petra, and the Great Pyramids. The Taj Mahal was beautiful and impressive in its craftsmanship. I wasn't impressed by the scale, but the symmentry and the intricate detail. So go to admire that, and you will be impressed. My next stop was Singapore. If there is a polar opposite to India, it is either Switzerland or Singapore, so it was interesting to sandwich India between those two experiences. There I was able to see my college friend, Chi-Ho and his adorable 21 month old triplets (2 girls one boy). Chi-Ho said they were the first triplets in Singapore's history. They certainly were the cutest! For all you parents out there wondering how Chi-Ho and Ai-Ling manage, they have two Indonesian nannies to help out. My two friends with triplets have both said the same thing to me separately. They actually sleep more than most parents of one kid because you have to get a nighttime nanny with triplets. Who would have thought! At the end of my year backpacking through Asia-Pacific in 1999-2000, I complied a best and worst of list that was 'wildly' popular. So back by popular demand is my compilation from my recent trip through Central Europe (1 month) and Africa (7 months Johannesburg to Jerusalem). I kept a running list in my journal as I traveled. When drafting this post, I went back to my old Asia travel log to get more ideas. It was fun re-reading those. Enjoy! Least Impressive Sight - Souvenir shops in Jerusalem. I had to wonder, "Did Jesus trip over all the souvenir stalls when carrying the cross along the Via Dolorosa?" Best lesson for overland Africa travel - Don't ever get into a bus without water and something to read as there will be delays! Travel tip I stumbled upon just by being nice - When you get on the bus, buy some bananas or peanuts or fruit from the vendors around the bus. Share them with your neighbors. When you arrive at your destination, they will typically help you find where you need to go to return the favor. I also noticed that while I ate peanuts by popping a handful in my mouth, every African ate them one at a time. This made realize our different perspectives on food. Best airline - Ethiopian Airways. They do a great job and are as good or better than most US airlines. Best airport - Addis Ababa, Ethiopia. They had new Dell computers for their modern visa-on-demand immigration department. Best pasta I've ever had - Castelli's restaurant in Addis Ababa, Ethiopia. Owned by the same Italian family since 1938 complete with Mama Castelli residing over the entrance/register. According to the articles next to the photos of Presidents Clinton and Carter, Bob Geldoff agrees with me. Book that best approximates my journey - Paul Theroux's "Dark Star Safari - Overland from Cairo to Cape Town"
Best book I read on the trip - "The Price of a Dream: The Story of the Grameen Bank" by David Bornstein. This inspiring story on Mohammed Yanus' creation of the microlending phenomenon in Bangladesh was amazing. Two months after I finished the book, Yanus and the Grameen Bank won the well deserved Nobel Peace Prize. Bornstein's 2nd book, "How to Change the World: Social Entrepreneurs and the Power of New Ideas" is also a great read. Best travel partner - Eliza! First place I met someone who liked George W Bush - a man sitting with the street cobbler who fixed my hiking boots in Arusha, Tanzania. The next person I met who liked Bush was in Israel, but then he went on about how Israel should drop a nuclear bomb on Iran. They love Bush in Israel...can you guess why? Thing I miss most from Africa - all the smiling kids yelling "Mazungu" (loosely translated as 'White Man') and waving. The kids are adorable and surprisingly happy in Africa. Most adorable kids - Harar, Ethiopia. They didn't beg. Best beaches - Paje, Zanzibar - what I call "screen saver beaches"
Consecutive months on the continent of Africa - 5.5 exactly - I arrived in Johannesburg on June 15, 2006 and crossed under the Suez Canal on November 30th. I then spent another month back in Africa after two weeks in Jordan and Israel. Most useless taxi drivers - Cairo. "I thought I was paying you to know where this address is." Coldest nights - camping in Namibia and backpacker hotels in Jordan. The desert is cold at night! Favorite souvenir - my Harar Beer glass. That glass will always bring a smile to my face of Chad and I getting into the brewery and meeting the Managing Director just so I could get a glass for my collection. Most under-rated country in Africa - Namibia. The desert sand dunes, Fish River Canyon and Etosha National Park are spectacular. All in a former German colony that functions and is safe. Most over-rated thing to do in Africa - climbing Mt. Kilimanjaro (sorry Mike and Simon!) I was glad I did it and had a great time with Mike and Simon. That said, when I saw how many westerners climbed it and paid so much to do so (200 people summited the same day I did), I wondered why more westerners don't see more of the rest of Africa instead. Best hotel - Sarena Hotel's Kirawira Luxury Camp, Serengeti National Park, Tanzania. I stayed here on the National Geographic Expeditions trip. This hotel was everything you could imagine for an "Out of Africa" experience and more. I was there on New Years Eve the second time and learned that the Tanzanians really love to celebrate living another year on New Years Eve! Best fresh fruit smoothies - Ethiopia. Drink I'm glad I didn't try - home brewed 'tej' in the farmer's bar in Lalibela. I told Chad that stuff would give me worms or something. He learned that I was right in my assessment. Worst bed - Moses' Guest House in Sipi Falls, Uganda. Nice people and beautiful spot, but I felt every slat under my very thin foam mattress. Worse bus ride - 15 hours from Mtwara to Kilwa, Tanzania after being turned away from the Mozambique border. The road was completely bumpy as we drove over make shift roads next to an enticing brand new freeway weeks away from opening. I'm not sure I would have survived the crowded, bumpy experience had Andrew and Helen from London not happened onto the same bus trip. Longest single delay - waiting for the two-hour noon ferry to leave from Egypt to Jordan. It left at 5:30pm and arrived at 9pm. Favorite break down - on bus from Dar es Salaam to Moshi, Tanzania. Somehow after an hour, the steward on our Scandinavian Bus Lines trip was able to fix our Scania bus with just a piece of twine. I kid you not. Country I'm most waiting for the dictator to pass on: Robert Mugabe in Zimbabwe. The hyperinflation was interesting to witness first hand as a tourist again (the first time I experienced hyperinflation was in Argentina in the 1980s). But the hardships Mugabe's foolish rule have imposed on the innocent Zimbabweans is very sad and not so interesting to those stuck in Zimbabwe under his rule. Biggest surprise - How friendly the Africans are and how different Africans are from the perceptions we get via the news in Africa - "Life is cheap over there, be careful." or "You'll get sick and die." or "They are so poor they will rob you blind." The opposite is true. Most interesting haircut - At a barber in the Sinai port town of Nuwieba, Egypt waiting several hours for the aforementioned ferry to Aqaba, Jordan. All of a sudden he took out a piece of string, put it between his fingers like dental floss with one end in his mouth to pull and started plucking my eyebrows. I was too busy smarting from the sudden pain to laugh at the sight of it in the mirror through my watering eyes! Best museum - Apartheid Museum in Johannesburg. If you want to see the same thing, go to the Civil Rights Museum in Memphis, Tennessee at the Lorraine Motel (where MLK was assassinated). The difference is that South Africa has come further in 15 years than we have in 50. Best lesson learned: The sooner you accept the reality of the situation, the sooner you will feel a wave of comfort and acceptance come over you to replace all the stress and anger you might feel from the situation. I learned this while trying to convince the Mozambique border guard to grant me a visa rather than making me retrace my steps for several hours to Tanzania and have tried to keep it with me as I keep wondering through life. Thanks for sharing my part of my life's journey with me. I expect to keep blogging about my travels and life about it even if only my Mother reads these posts! When I started my eight month Africa journey, I had to pack from memory as I never wrote down what I packed on my year backpacking through Asia-Pacific in 1999. So this time I swore I'd write it down. Attached is my advice on what to pack when backpacking for several weeks or months. Enjoy! "Any flights in January from Dar es Salaam to Houston? What about from Kilimanjaro airport? Humm, what about from Nairobi? Yep, but not until January 15th and you'll have to spend a couple days in London." So I decided to spend the extra time visiting the Kenyan Rift Valley. I felt that I hadn't properly experienced Kenya and its famous lakes, especially given my focus on the rest of East Africa. I had been to Kenya's Lamu island for a week in November with Eliza and had a wonderful time. On my Africa trip I visited three of the four Swahili islands - Lamu, Zanzibar, and Mafia (I didn't see the famous diving island of Pemba). Lamu is the most authentic traditional Swahili culture as well as being quite relaxing and nice. The beaches on Zanzibar are the nicest, but the pace on Lamu was more relaxing and genuine. The two Kenyans we met at the Lamu airport 'security' (a shed by an open airstrip) mentioned Barack Obama as soon as they realized we were American. Senator Obama had recently visited his father's homeland. They both sincerely hoped Obama would become US President then afterwards become Kenya's President. That would certainly be nice for Kenya as the country has a big corruption problem with their current politicians. The Kenyan Rift Valley was a great way to end my trip through Africa as it is the image of Africa you would picture in your mind. The views from the hills down into the rift valley were beautiful. I went to Lake Naivasha about two hours by local matatu (a crowded van that forms the backbone of local African transportation) primarily to mountain bike through Hell's Gate National Park. I enjoyed that day tremendously. It is nice to see giraffes and zebra from a bicycle. In theory wild predators could be present too, but in practice there are none there which is why you can bike and hike through this park. The park also has many geothermal power plants producing clean energy from the steam rising up through this tectonic scar. The availability of clean energy and heat, as well as the source of fresh water, altitude and year round equatorial sun make this area a prime place for flower farms. Here is where many of the roses and flowers are grown for British and European grocery stores and florists. I was so curious about the industry, I was determined to get a tour. I rode my bike down the street and after a few calls and persistent pleas, I met Steve, the very nice third generation white Kenyan manager of a Dutch owned flower breeder. We had a great conversation stretching over an hour. I learned a lot about the flower industry which I won't bore you with. But I will share this valuable useless statistic I learned - 50% of all flowers sold are red. The area seemed quite busy getting ready for the Valentines Day rush that was a month away. While hiking in Hell's Gate, I met one of the most interesting local people I met on my seven months in Africa. Jehoshaphat is a 21 year old Masai warrior who was wise beyond his years despite having never gone to a school as we know it. Over the past two years he taught himself how to read and write as well as speak fluent English. He told me a story which I will share with you now as I got such a kick out of his telling it to me. When 13 Jehoshaphat went through the Masai coming of age ceremony for boys of his age group. This included being circumcised and then going to live in the bush for three years while being trained in the Masai traditions by their elders. He told me that two of the sixteen were killed by lions during this three year period. When he was 14, his group of warriors in training went on a three month hike around the region. While at Mt. Kilimanjaro the group came across a white tourist climbing Africa's tallest peak. Jehoshaphat told me this was the first white person he had ever seen, which is amazing when you consider they lived within a two hour drive from Nairobi. This white tourist kindly offered them a plate of spaghetti. As Masai only eat meat and drink milk or cow's blood, they had never seen pasta. Jehoshaphat told me with a smile that they thought it was a plate of worms. They asked each other, "Why is this man feeding us worms?". One warrior used his spear to stab the 'worms' on the plate and in the process of doing so broke the tourist's bowl. They then left (without trying the worms) wondering why white people eat worms and bothered climbing to the top of a cold mountain. A short while later the group came across a Japanese tourist. The Japanese tourist naturally picked up his big camera with a telephoto lens and started talking pictures of the group of young Masai warriors from a distance. Jehoshaphat said they had seen guns before on local policemen and thought this camera and its long lens was a big gun. So they all hit the ground to keep from being shot! As they lay hidden in the tall grass, they asked each other, "Why does this man want to shoot us? We haven't done anything to him." One of the boys said, "Maybe the white man told him we broke his bowl killing the worms." Jehoshaphat told me, again with a laugh in hindsight, that the boys decided that they should die like warriors rather than hiding in the grass. So they slowly sneaked around the Japanese tourist's camp "by crawling in the grass like snakes". When they had him surrounded, one Masai stood up and whistled. Then the other warriors whistled to let the Japanese man know he was surrounded. Still the tourist took out his camera to take pictures of these warriors. So, as told to me by Jehoshaphat, one warrior started running towards the Japanese tourist with his spear drawn. The Japanese man's local tour guide shouted at the Masai boys in the Swahili language that the Japanese man wanted to do no harm. The guide tried to explain that the tourist was just using a camera to take their photo. But Jehoshaphat said they didn't know much Swahili and certainly didn't know what a 'camera' was. So one of the warriors went up to the Japanese man while the others stood guard with their spears. The boy looked through the camera and suddenly saw up close the mountain that was actually far away. Jehoshaphat said the warrior told them, "this man uses this gun to bring me closer to then kill me." So the warrior smashed his camera and shattered the lens! Jehoshaphat said they opened the camera and saw this round canister with a ribbon coming out of it. They thought this must be the bullets and so took it all out and cut the ribbon in half as it kept coming out. They then walked off, leaving the Japanese man behind, who must have been disappointed that he lost his camera and photos but surely he must have been happy that he wasn't killed by Masai warriors thinking they were defending themselves from his large gun. Jehoshaphat smiled when he told me that a couple years later after he had started guiding tourists in Hell's Gate National Park he learned what a 'camera' was. He laughed when recalling the moment he realized the poor Japanese tourist was just trying to take their picture. I had to smile when he wisely told me, "Of course it is too late now to apologize to that Japanese man." Jehoshaphat and his warm insight into his life as a Masai warrior on the fringe of the developing world will be one of my fondest memories from Africa. It was nice to bookend my seven months in Africa with two days of hiking with Jehoshaphat. Within 72 hours of his telling me this story I found myself landing in a very familiar Heathrow airport en route back to my family and reality of being back in America. For ten days spanning the New Year, I worked for the second time as an assistant tour leader on a National Geographic Travel safari in Tanzania. The tour leader was an amazing man named Joseph Kitia who was one of the first game wardens in Tanzania, chief instructor of the wildlife college and now mayor of his town (shown in this photo with me and the NG wildlife expert on the trip, Stephanie). Joseph is exactly the kind of person Tanzania and Africa needs to develop as he has a heart of gold, is honest, and a genuinely nice man. Because of this, he is well liked and known by many. So it didn't surprise me when Joseph told me that the Prime Minister was staying at our hotel and that Joseph was trying to arrange a meeting for us. Before I knew it, me Joseph, Meave Leakey (the famous hominid archeologist who was a NG speaker on the trip), and three clients were having a 45 minute conversation with Tanzanian's Prime Minister Edward Lowassa. He was a nice and articulate man who was elected last year along with the President on a anti-corruption and pro-development platform. Based on my informal poll of safari and taxi drivers, Prime Minister Lowassa is really popular and respected for being a non-corrupted man of action. I did get the sense that when Meave made a plea for him to restore and re-open for tourists many sights discovered by her in-laws in Oldevei Gorge, he was sincere that he would follow up with his tourism minister the next day. Joseph assured me that the PM was sure to do just that. In a continent of self interested leaders, his man-of-action approach is admired by the general Tanzanian public. I made an impassioned plea that Tanzania continue to protect its environment and wildlife. Tanzania does a better job than most other African countries managing its wildlife, which is why it is the best place to go for safaris. The Prime Minister's main request of us was to help him promote Tanzanian tourism. He suspected that most Americans think of Kenya when they think of traveling to Africa when, as he pointed out, Tanzania has better wildlife and sights. He is right, for only Tanzania has the Serengeti ecosystem, Oldevei Gorge, and the spectacular Ngorongoro Crater, among other national wildlife reserves. My advice is that you all think of Tanzania first when considering a safari in Africa. 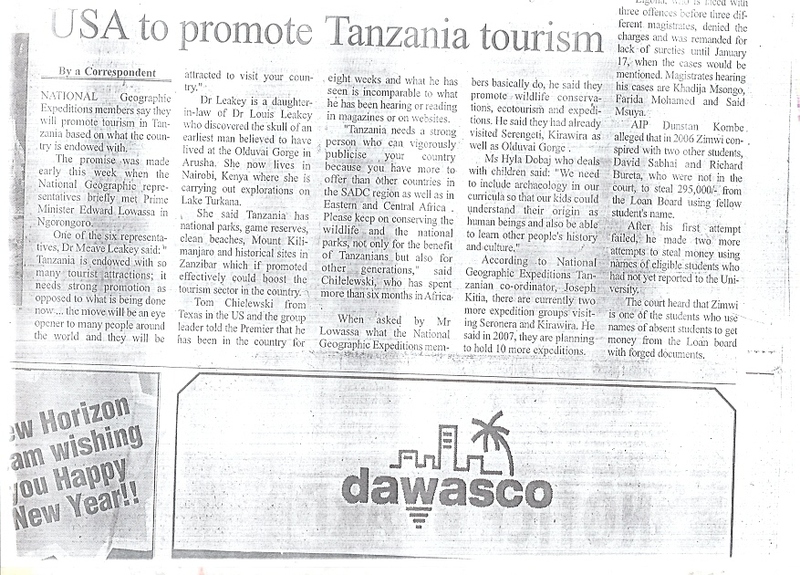 He also asked our advice on how to promote awareness of Tanzania. I told him he needed Oprah and suggested he write her a personal letter inviting her to come to Tanzania. When I started this trip, you'd be surprised how many people asked me if I was going to Namibia, which they had just heard about because 'Brangelina' were having their baby there. So I also suggested that he get some celebrity like Britney Spears to have her baby in Tanzania (chuckles all around, but I was serious). The PM's press secretary pushed out a press release that was picked up on page 3 of almost all the national papers. I read the three English language papers all of which carried a quote by yours truely! Click here to read one such article: Download TanzaniaDailyNews5Jan2007.jpg Of course, they misspelled Chmielewski, but that's to be expected. Fortunately they didn't put in my quote about Britney Spears! I crossed back into Egypt overland at the Israeli port of Elat and drove back across the Sinai into Cairo. There I was joined by my travel partner from South Africa and Namibia, Eliza. We had a great couple weeks together and really enjoyed seeing Egypt, both for the first time. To be honest, I expected Egypt to be more like Morocco, which I visited years ago. One thing I didn't like about Morocco was how everyone was 'on the take' and seemingly always trying to find ways to take my money. While the Egyptians were happy to sell you something, I found them much more casual. Overall I found Egyptians to be quite pleasant people. Humorously, Cairo on the other hand is crazy. Before my arrival I didn't realize just how large Cairo is with over 20 million people! It reminded me of other second world megalopolises I have visited, in particular Buenos Aires and Mexico City. The one difference was of course the Muslim influence, which made it quite a safe place to walk around as well as filling the air with over one hundred calls to prayer from the many nearby mosques five times a day. The simultaneous outbreak of so many mosques broadcasting their beautiful chants across the huge city is a sound I will always associate with Cairo. The Egyptians are very pro-American and love Americans even though they don't like the Iraq war or George W. Bush. I think Middle Eastern citizens understand what it is like to have a government they don't personally agree with, and so they separate their opinions of Americans from their opinion of the American government. At least that was my experience in Egypt and Jordan. Egypt is definitely suffering from a tourism slowdown since 9/11, further complicated by the Iraq war and trouble in the region in general. As a result, they are quite eager to make sure tourists have a good time in Egypt and are surprisingly service oriented. You can travel pretty inexpensively in Egypt. For example our eight day independent organized tour in nice three star hotels, with a great guide for just the two of us and a nice Nile cruise was only $500 per person (admittedly booked in Cairo). At first I was skeptical as I normally prefer independent travel to taking a tour, but this really was just a pre-booked itinerary and was quite a good way to see the major sights of Egypt. (Not unlike how many people travel around Vietnam as it is hard to do the same itinerary more cheaply or efficiently as an independent traveler). The sights in Egypt are spectacular. It really is a country you probably should see at some point in your life. I couldn't believe how well preserved the colors were inside the tombs after 3000+ years. After a few days, you couldn't help but feel like a closet Egyptologist, recognizing the various gods and recalling the stories and symbols told on the temple walls. It really was an interesting culture which has been very well preserved simply due to the dry nature and shifting sands of the Saharan desert. Over the past hundred years continuing to this day, Egyptian and Western archiologists have been discovering and restoring the temples and tombs of ancient Egypt. There is little point in my reliving the sights of Giza, Luxor, the Valley of the Kings, and Abu Simbel for you as you've probably seen the same photos I had in National Geographic. All I will say is that it is one thing to see photos of those many sights, and quite another to see them in person. I would encourage you to take one to two weeks in your life to visit Egypt. They are geared up for all level of tourists as tourism is one of their largest industries. I suspect you wil enjoy the experience as much as we did. Driving across the border from Amman to Jerusalem was an interesting experience. While the individual Israelis I met were very hospitable, my Israeli friends warned me that the Israeli culture in general is not very hospitable. I have to say they were generally correct, which is a stark difference to the very hospitable cultures I experienced in Egypt and Jordan. That said, Israel is an amazing place. Once I was in Jerusalem, I found myself unable to leave as there was so much to see and learn that appealed to my curiosity and love of history. Before I could even get to Jerusalem I had to get through the Allenby bridge border crossing between Jordan and Israel through the West Bank, which was like getting through Washington DC airport security times ten. I noticed that all the border staff were young men and (mostly) women aged between what seemed 18 and 24 to me. It was funny to see the plain clothes officers trying to blend in. Somehow the not so concealed pistol, sunglasses and obvious attitude gave them away to me. Sadly, I suspect that two years of yelling at their neighbors trying to enter Israel probably will shape the attitudes of these young Israelis for decades. I worried that this experience will solidify attitudes against regional peace throughout the generations of youngsters rotating through their mandatory army service. After two hours of border processing, I boarded a public bus. We crossed through the Palestinian Authority, passing road signs to Ramallah along the way, and were dropped off at the Damascus gate in the Arab quarter of Jerusalem. Seven years ago on a raft trip in Nepal, a fellow backpacker told me Jerusalem was the most interesting place she had ever visited. Ever since then I have wanted to go. I must say without a doubt, Jerusalem is one of the most interesting places I have ever been. It is tied with Varanasi, India, as the most orthodox, devout, and fanatical place I've ever been. I found myself unable to leave Jerusalem. Not because I suffered from "Jerusalem syndrome" thinking I was some messiah, but because the city simultaneously quenched and perked my insatiable curiosity about history, current events, and the world's religions. I have never been in a place that was so full of history and spirituality in such a small space. You don't need to be a spiritual person yourself to be impressed, so long as you have an appreciation for the impact of religion on the world. I had read about but never fully appreciated the proximity of the major Jewish, Christian, and Muslim sites and communities in Old Town Jerusalem. These places I had learned about for years are literally on top of each other. Moreover, these cultures that are often at conflict are clearly very intertwined, even if the residents don't want to admit it. As an outsider I was taken more by the similarities rather than the differences between their cultures and traditions. Sadly, I suspected the protagonists in the conflicts would deny the similarities, and in doing so, miss an opportunity to find common ground. I could write a whole blog on Israel itself and probably ruin any chances to run for US senate in the process as I also learned it is difficult to say anything about the region without offending someone unintentionally. I will leave you with my three impressions of the Middle East peace issue having now been to Israel and apologize if I offend anyone in the process. First, I used to often wonder why the US and the world bothered to try to get the Israelis and Palestinians to make peace. If they didn't want to get along, why waste our efforts until they were serious about peace? Now I realize that so many regional issues are tied to the Israeli-Palestinian peace process. Once Israel and Palestine have made a real and lasting peace agreement, then other issues can be resolved. More importantly, other regional players and forces will lose some of their stated reason d'etre. So I concluded that peace between Israel and Palestine is important and worth continual efforts by other governments and organizations outside the region. Second, I knew but did not really appreciate how these past 60 years fit in the 3000 year history of the Jewish culture until I saw the historical sights in Jerusalem and met Jews who communicated their views of their lives in Israel relative to Jewish history. It is very clear to me now that the Jewish people worldwide would never let the country of Israel cease to exist. I think the sooner the rest of the Middle East accepts this, the sooner peace will come. I also realized that it is too bad the Arab leaders cannot (and probably choose not) to come to Jerusalem for themselves to see what Israel has accomplished. There is nothing like seeing something first hand to formulate your own impressions. Perhaps a program to bring Arab leaders to Israel might change some of their opinions of the country and move them towards peace. Call me an optimist. Thirdly, peace will not come until the moderate Jewish influences throughout the world and within Israel convince the Israel government and its citizens that Israel cannot treat its Arab citizens and Palestinian neighbors the way they have. While I was in Israel, Jimmy Carter's new book, "Palestine: Peace not Apartheid", received lots of press coverage. I have not read Carter's book. What I found interesting was that one of my first thoughts when I visited Bethlehem after crossing the new barrier wall was that what I was seeing is apartheid. I read many editorials in Israel against Carter's classification of the treatment of Palestinians as a form of apartheid. I've been to the civil rights museum in Memphis and the apartheid museum in Johannesburg. I must say, the Israeli laws and actions against the Palestinians that I witnessed at the borders and in Jerusalem are very similar to the displays of history I saw in those museums. While it was clear to me that Israel will continue to exist at least in my foreseeable future, it was also very clear to me that Jews should realize the biggest threat to Israel's existence is the way Israel treats the Palestinians. On the bus back to Cairo I met a nice American Israeli woman traveling with her teenage sons for a long weekend to show them Cairo. As we crossed the Sinai, she confided to me that her husband fought there during the 1973 war. She now works at a Jewish non-profit organization trying to influence Israeli policy towards Palestinians in Jerusalem. She said they argue that it is in Israel's best interest to improve the way they treat the Palestinians. She agreed with my observations and added that she was saddened that a people that knew what it meant to be an oppressed minority were treating its minority population in such a way. Furthermore, she felt the actions of Israel, for better or worse, reflected on her as a Jew, which was why she was working to convince the government that it was in their best interest to change their policies towards Palestinians. I hope more Jewish people worldwide take her approach rather than blindly supporting the current policies of the Israeli government or automatically chastising anyone who tries to constructively criticize Israel. I have learned over the years that in life the scales of negotiation always come into balance. I fear that if the Israelis don't change their policies soon, eventually Israel's antagonists will find a way to balance the situation. This would be quite sad for all parties, the region, and world as Israel and its neighbors are full of wonderful history and people from all backgrounds and beliefs. Perhaps naively, I believe and hope that they should all be able to get along. I certainly will pray to see that in my lifetime as the people I met in Isreal, Jordan and Egypt deserve that. In the mean time, I encourage you to visit the region. I found the sites unbelievable, the history intoxicating, the people incredibly warm, the food outstanding, and the areas to be quite safe and welcoming to tourists. I broke up my overland trip by flying again, this time from Nairobi to Cairo. While I hear the Sudan is quite nice, I didn't feel it appropriate at this time to drive overland through Sudan! Once in Cairo I headed to the Sinai peninsula to scuba dive in the Red Sea. Exactly six and a half months after landing in Africa, I crossed under the Suez canal and effectively left the continent of Africa. My first impression of this beautiful Sinai desert was amazement that so many wars were fought over such a desolate piece of land. But of course they weren't wars for the resources, really. I headed to the relaxed town of Dahab. It was nice but a little quiet in the off season. It is also where a terrorist bomb went of eight months ago. I felt perfectly safe as you must go through several check points in this part of the world. And the locals were very friendly. The diving was good, but didn't live up to my expectations. I think the Great Barrier Reef and Cozamel were better. So all in all, I'd go there if you were in the region or on a religious pilgrimage to Mt. Sinai, but I wouldn't make a trip just to see the Sinai beaches. From there I took the very slow ferry to Aqaba Jordan. This was interesting as we could see Saudi Arabia, Jordan, Israel and Egypt all from the boat deck. I met a Spanish couple and spent the many hours practicing my Spanish as our ferry was continually delayed. We met two very nice Egyptian men who import used cars and were waiting for their inventory to be released from customs. Typical to the region and to Egyptians in general, they were very hospitable. They also had great things to say about Americans. They, like everyone else I met in Egypt and Jordan didn't like George W Bush or his policies and feel he has made a mess of Iraq. I certainly didn't disagree with them. We made it into Petra very late and were not disappointed by our efforts the next day. Petra has been a place I wanted to visit ever since I had seen my friend Randy's photos several years ago. Most people recognize it as the place Indiana Jones found the Holy Grail in his "Last Crusade". Petra is an area of noble tombs and temples of the Nabataean people. They were contemporaries with the Romans at the time of Christ and made their money by charging taxes on the many trade caravans that crossed their territory. To me that means they ran an old time 'protection racket'. Eventually the Romans (who mastered the protection racket industry) didn't like competition, and quashed the Nabataeans into submission. Fortunately for us, not before the Nabataens had carved some amazing facades into the yellow and red sandstone cliff faces. The Nabataeans were also famous for their knowledge and control of water in this desert. So the channels you see carved into the sides of the gorge walls leading to the famous "treasury" building are how the Nabataens collected water. They effectively created an artificial oasis town in the middle of the desert. The "Treasury" was actually a temple rather than a treasury. Subsequent bedouins and Europeans were convinced such a beautiful building contained riches. The bullet holes from their failed attempts to shoot open the urn at the top of the building still scar the facade. Eventually they discovered the urn was solid rock like the rest of the building. I found the Jordanians, like the Egyptians, to be quite hospitable and friendly people. They were happy to see tourists as the industry is down in the region. They liked me as an American and thankfully separated their impression and opinion of me from their impression of my government. I came to the conclusion that Middle Easterners are so used to living under poor governments that they easily separate their feelings for a person from their feelings for his/her government. En route north to the capital, Amman, I did stop to float in the very salty Dead Sea. It certainly lived up to its billing. Until I was actually floating in the somewhat slimy water, I wondered what's going to be so great about this? A few moments later as I was floating sitting up, I caught myself saying, this is really cool. The salt irritates all cuts, so it wasn't a place to swim in for more than a few minutes, but definitely worth the diversion. The other major sight in Jordan I saw was the Roman ruins in Jerash, one hour north of Amman (which I learned was known as Philadelphia in ancient times). They have done a good job of restoring the Roman town. I got a good impression of the wealth and grandeur of those times. Jerash was one of the ten great cities of the Decapolis League economic and political confederation during the Roman rule. Accordingly, it was fairly wealthy. As in Pompei, I enjoyed seeing the ruts carved into the paving stones by the many chariots that had driven these roads two thousand years ago. This brought the ruins to life for me. I would highly recommend a several day excursion to Jordan (Petra especialy) if you are ever in Israel or Egypt. I suspect you will be pleasantly surprised by the sights and friendly people in Jordan, just as I was. Ten years ago I saw some photos of the rock hewn churches in Lalibela, Ethiopia . Those photos planted the seeds for my trip to Africa. So I knew that my journey would include Ethiopia before I left Africa, if nothing else as an homage to the country that set this trip in motion long ago. Despite these high expectations, Ethiopia did not disappoint me. I suspect in the future a lot more tourists would be coming to Ethiopia. Of course land locked Ethiopia has no beach attractions like many other African tourist destinations. If anything, being sandwiched between Somalia and Sudan probably scares people away. A month after I visited in November Ethiopia attacked Somalia. I'm sure this only increased the work required by the two Americans I met who have the contract to market Ethiopian tourism in the US. We met at the Lucy hominid skeleton which is making a US tour starting at the Houston Museum of Natural Science in Sept 2007. Ethiopia is unique even within Africa in many ways. They were never really colonized, probably as much due to the fact that it was fascist Italy who tried to do so as the strength of Ethiopian resistance. Ethiopians have their own script, own religion (Ethiopian Christian Orthodox), own food (you've probably had the injira flat bread at an Ethiopian restaurant) and own culture. So unlike much of East Africa whose borders were mostly lines made on maps by colonial powers, I definitely got the sense that Ethiopia was its own country. Part of Ethiopia's charm is its faith and long religious tradition. Christianity arrived in the fourth century (for perspective, Christianity didn't arrive to Poland for another 500 years). The Ethiopians firmly believe their 3000 year dynasty descended from the union of the Queen of Sheba and King Solomon. Ethiopians believe their royal son returned to Ethiopia from a visit to his father in Israel with the Ark of the Covenant. To this day, Ethiopians believe the Ark is under the watch of one lone senior monk in the town of Axum. The monk in this photo is the only person who can see Moses' original tablets once a year. Interestingly enough, I subsequently learned on a tour of the Western Wall tunnels in Jerusalem that Jews of the second temple era had the same tradition of only one senior rabbi seeing the "Holy of Holies" in the Temple Mount. I was surprised to realize that the ancient Jews and modern day Ethiopian Orthodox Christians called the Ark the exact same thing - "the Holy of Holies". Like the second temple in ancient Jerusalem, every Ethiopian Orthodox church has a room in the center called the Holy of Holies where only the priests can enter and only the most senior priest can see the replicas of the Ten Commandment tablets housed therein. The imprints of ancient Jewish tradition as well as one of the earliest Christian churches can be found all over the country. Ethiopia is, after all, the closest Christian country to the Holy Land. Modern Ethiopia has two Sabbaths, Saturday and Sunday as Ethiopia had a vibrant small Jewish community until they were all airlifted to Israel during the 1991 famine. This community was also a time capsule as their Jewish traditions are centuries old. The modern day faith by most Ethiopians that the Ark is in Axum contributed to the charm of Ethiopia. There were many times as I traveled around rural Ethiopia when I thought that their lives might not have changed so much over the past 3000 years, such as this scene of farmers harvesting grain with scythes. What I didn't realize until recently was that the last emperor of the 3000 year dynasty (albeit with a couple genetic breaks along the way that the man on the Ethiopian street chooses to ignore) was Ras Tafari, also known as Haile Selassie. He was strangled in 1974 by the communist coup leader and subsequent brutal dictator who ignored the starvation of his people during the famines of the 1990s. During Ras Tafari's life, several Jamaicans including some decent reggae musicians made Haile Selassie the center of their religion. The mostly devote Christian Ethiopians find this quite amusing. It certainly puts Bob Marley's music into some sort of perspective knowing that Rastafarian's worship a man who was an Ethiopian dictator for four decades. "His Imperial Majesty Haile Selassie I, Conquering Lion of the Tribe of Judah, King of Kings and Elect of God" (as he called himself), not being one to turn away unwarranted adoration, apparently gave his worshipers some land in Southern Ethiopia where many live today. I didn't see it but can say they have less of an impact on modern day Ethiopia than the tribe of Israelis who migrated to Ethiopia millenia ago. We did a standard northern route itinerary, like the one outlined in a New York Times article last year. As Chad said, I "outsourced" the itinerary to him while I traveled Uganda, and he did a great job. First we flew on the genuinely wonderful Ethiopian airlines to Axum to see where the Ark is kept and the huge funeral stelae. Similar to Easter Island in a way, the pre-Christian kings of the third and fourth centuries quarried huge single blocks of granite and erected them as funeral tributes. Being men, each king had to outdo his predecessor. This lasted until the last king's stela - the largest single piece of granite every quarried - fell over upon erection (no pun intended). With it collapsed the reign of that king and the stela tradition. The next king took this as an omen and converted to Christianity. The broken stela remains where it landed to this day. You can't help but wonder how they every got it and the other stelae there to begin with. Cranes will be what they use eventually to re-erect the largest stela that ever stood. Musolini's army cut it into three pieces and stole it in 1937. In 2005 Rome returned it, although it now lays next to its former neighbors waiting in true modern African style for some Western money and know how to re-erect it. The only evidence I saw of any real effort to complete this diplomatic victory were banners in the new airport anouncing the stela's triumphant return. Locals will tell you with a straight face that the ancient Ethiopians used the power of the Ark to erect the stelae long ago. Perhaps they should conjure some of that power up again now, as it might come sooner than a crane in rural and poor Ethiopia! Outside of Axum we took a tour through the beautiful but strained countryside to a monastery on top of a flat mountain where only males are allowed. To get there you have to climb up a 25 yard high cliff face using a rawhide rope. When you get to the top, you realize that your life was in the hands of this old (but friendly and apparently strong) monk who was belaying you! Fortunately the 'ropes' are strong enough to pull up the donated bulls and rams as no female livestock are allowed up top either. Chad and I will never forget that experience. Going down was no less scary, although it was quite safe. You should have seen the local men scurry up the cliff face without any safety rope. Our next stop was Lalibela, which did not disappoint. About 1000 years ago, King Lalibela was inspired to create a replica of Jerusalem by hewing eleven churches out of the red rock by carving not up but down! It really was spectacular, like Petra in Jordan or Angkor Wat in Cambodia. They are still functioning churches and quite elaborate inside. We couldn't help but stand inside in awe that they hollowed out the columns and rooms from within the church they had carved. On Saturday night there was an all night pre-Christmas ceremony outside one of the beautiful churches we attended. The priests were marking the holy family having fled to Egypt to escape Harod's order to kill all first born sons. While the locals are quite devout, I learned the the event, which occurred four Saturdays in a row, was also 'the' social event for the local singles. Our guide told us that for many teenagers and youngsters it is the chance for them to meet clandestinely with their girlfriend or boyfriend and talk secretly under the auspices of a public religious ceremony. In fact, I did see many youngsters innocently huddled together whispering throughout the cold night while the community and some tourists watched the fifty of so priests dance, chant, and play music under candlelight and colorful icon paintings marched around us as part of the ceremony. The community was genuinely worshiping throughout the entire night. We felt very welcome to participate in this tradition that probably had been going on for hundreds of years with few changes. I suspect many a local couple has met or proclaimed their love for each other over the centuries at ceremonies just like the beautiful one we saw in Lalibela. We saw lots of other great sights in Ethiopia. I'd have to say that Chad's and my favorite place and people were in the famous city of Harar not too far from the Somalia border. In the 18th century Harar citizens apparently would kill any non Muslim who entered the city out of fear of a prophecy that the city would decline if a Christian entered its (still standing) walls. In 1854 the famous British explorer, Sir Richard Burton, disguised himself as a Muslim and stayed there for ten days before he was discovered. The citizens of Harar decided not to injure him and no curse came upon them. And while even today Harar has a reputation of being somewhat xenophobic, I would say that was not at all the case. In fact, both Chad and I felt the people of Harar were the nicest and the most welcoming people we met in Ethiopia. It helped that it was the only place where the kids did not beg or hassle us. In fact, Harar is really a model community for the region as Christians and Muslims live together peacefully in this walled city. Being close to Somalia, there was quite a bit of free trade going on in Harar. We saw lots of electronics smuggled in from Somalia (originally via Dubai I'm told) as well as a thriving 'chat' trade. Chat is the narcotic leaf that Somalis, Ethiopians, Kenyans, Yemanese, and many Arabs chew constantly. In fact, if you read the articles closely on the recent war in Somalia, the Somalis' main complaint about the Islamic government was that they outlawed chat! The Somalis cheered the arriving Ethiopian troops because the chat markets opened back up immediately. Chat is quite the cash crop as Yemanese and other Arabs pay top dollar for less than 24 hour old fresh Ethiopian leaf flown over daily. So much so that the famous Harar coffee fields are being replaced with chat fields. I was told that Ethiopia is trying to brand 'Harar coffee' ala 'champagne' but has some legal dispute with Starbucks. Another legacy of the brief Italian incursion in the 1930s is the now ubiquitous Italian espresso machine. Fellow tourists swore that Ethiopia makes the best coffee in Africa and some of the best in the world. Most other African countries, even those that grow great beans like Kenya and Tanzania only serve instant coffee. I don't drink coffee but I do drink beer. My favorite memory is Chad's and my quest to get a Harar beer glass for my famous beer glass collection. We talked our way into the brewery and into a meeting with the Managing Director as two HBS businessmen interested in the economics of their business! I didn't leave until I had secured my Harar beer glass which sits front and center in my display at home. As they now export beer to the US, I recommend you buy it the next time you come across it. I could go on and on about Ethiopia - about the man who feeds wild hyennas in Harar, about the monasteries on Lake Tana which is also the source of 9/10ths of the Nile's water, about the unique way Ethiopians dance, about the poverty I saw in the areas hardest hit by the famine years ago, about the nice orphans I met in this photo , about Addis Ababa and the best pasta I've ever had (Bob Geldorf agrees)... I guess that is the point. There is so much to see and experience in Ethiopia. The very friendly Ethiopians I met were not happy about their government, who like Burma, refused to accept that it lost a fair democratic election. I suspect most of you will think why go to a place so close to Somalia which recently attacked Somalia. In many ways though, Ethiopia is an island of relative stability in an interesting part of the world. I saw no real impact of the build up to war while we were there nor any impact of the war in neighboring Kenya. Even within Africa, that seemed a world away. Ethiopia will always be a country I remember as unique and friendly. For those of you with a sense of adventure, I highly recommend you explore Ethiopia. It's a shame more of us don't see what Ethiopia has to offer. The Ethiopians I met will surely welcome you with open arms and you won't be disappointed. I crossed into Southern Uganda from Rwanda by bus and headed to the beautiful Lake Bunyoni. In hindsight I would have stayed there longer, as it was one of the prettiest and most relaxing places I saw in Uganda. But when traveling, you never know what lies ahead. Especially when I enter a new country, I feel a need to keep moving in order to see what lies ahead before I run out of time. Churchill called Uganda "The Pearl of Africa". It certainly is lush and green, lying on the equator. It is here where I encountered my first days of rain in over four months of travel with the exception of one rainy day in the South African wine district. Here is where you see the deep red volcanic soil and the banana plantations clinging to the hillsides. Of course, Uganda is also where you see the Africa most of us expect based on the p erceptions we get through our filtered news reports. Uganda has plenty of poverty, lots of filth, and more than its share of political turmoil. But there is also that mysterious draw that Africa has on your soul. For example, I met a nice (Asian) Indian family returning to Uganda for a reunion of sorts after Idi Amin kicked them all out and took their businesses and property in August 1972. Like anyone who has lived in Africa, they admitted the continent was still in their blood. Homes in London and Ireland and spouses from Holland and America keep them from returning to Uganda permanently. Although I heard and could feel their excitement about being back in Uganda. They were contemplating buying four acres on Lake Bunyoni to build a vacation home. The farmer's opening bid was $10,000 meaning they probably could buy it for about half that. Not bad for four acres of beautiful lake front ,even if it is taken away again by some future despot. Of course, that is always a possibility in Uganda. When I was there, the news of the peace process with the awful Lord's Resistance Army in the North dominated the news. I read one story of President Museveni's surprise visit to the semi-autonomous region of South Sudan to meet with the chief negotiator of the LRA. The newspaper reported that the President extended his arm to shake her hand, at which point she withdrew her hand. The President said, "What, you won't shake my hand?" "Not until you apologize for (such and such)," she replied. He said he wouldn't do so until she apologized for such and such. After more yelling at each other, the five minute 'peace summit' ended. The next day the President of Sudan in Khartoum added insult to injury by filing a diplomatic protest that the Uganda President had visited Southern Sudan without following protocol with the official government of Sudan. And such is life in Africa near the equator! Interestingly enough, the rebellion could have been in a different country as far as tourism was concerned. I traveled freely without trouble in all areas south of an imaginary but known line in the North of the country that common sense dictated tourists shouldn't cross. For North of this line was in LRA control effectively. Before I could even approach this imaginary line, I did have to cross the real equator. I realized that while I had flown over it many times, I had never walked over the equator. I did learn that there are only ten countries through which the equator runs. I will let you get out your atlas to find out what those were. On this trip, I visited three of them - Uganda, Kenya and Democratic Republic of Congo. When you see the list, you'll wonder if being on the equator increases a country's chances of bad government! There were three other sights I particularly enjoyed visiting in Uganda. First, I headed north to Murchison Falls. Here, amidst hippos and Nile crocodiles, the Blue Nile narrows to just seven meters wide as the water plunges violently below. The roar and turbulence of this angry chute creates a natural foam that floats for miles downstream. I particularly enjoyed seeing the hippos pop their heads up through the floating field of foam. Not a place to take a refreshing dip in the water! Up river in the town of Jinga near the capital, I saw one of the two sources of the Nile. (I saw the other a week later in Ethiopia). Perched up at a high altitude on the equator, Lake Victoria is the source for the Blue Nile. This is why the water runs downhill in the Nile to the north. Jinga is also a haven for warm white water rafting and kayaking, at least until the Ugandans build another hydro-electric plant there to alleviate the frequent blackouts in the capital, Kampala. Closer to the Kenya border on the slopes of Mt Elgon, I hiked the scenic Sipi Falls. Several local expatriates told me it was their favorite part of Uganda, and I wasn't disappointed. While the four distinct waterfalls I saw on my day hike were the obvious tourist draw, I must say my highlight of the hike was meeting the villagers on the hike. My guide and I walked through many subsistence farms. This one family asked me to take their photo as they harvested new thatch for their huts (on the hill in the background of the photo) for the coming rainy season. On the road through the national park we were waved over by the local pygmy tribe who makes a living on infrequent tourists in this part of the world. After a brief 'visitation fee' negotiation with the 'king' of the tribe (as they referred to him), he welcomed us into their no longer nomadic community and asked us to sign into their visitors book. We were the first visitors they had had in five days, which might have explained their tenacity and aggressiveness in trying to sell us their many crafts. They also asked us to give them anything they could spot in France's car. The king (in green trousers and the feather crown) spoke perfect English and was a nice 30 year old man. He lined up his fellow men and insisted I take this picture. I love this next picture even more as you get a sense of just how short yet perfectly proportional they are. Wikipedia says it is because they have evolved not to experience the growth spurt most Homo sapiens have in our teenage years. I read another theory that indigenous people that lived away from the regular protein sources of the sea tended to be smaller in stature. Whatever the reason, these people and their culture were fascinating. We left after only about five or ten minutes. We were really more driven away by their constant sales pitches. I didn't have the heart to tell them that neither of us nor any other westerners could buy and return with most of their wares as our customs officials would surely confiscate a banjo made from a turtle shell or a bag made from a monitor lizard's paw. Instead I opted for the benign rattle made of a gourd to hang on my Christmas tree someday to remind me of the pygmy king and his village kingdom near the Uganda-DR Congo border. In the previous days I had met a few people working there. On my flight to Kigali I met a Dutch guy who lived down he street from my old apartment in The Hague. He worked for Oxfam and said the city of Goma was safe at the moment. (Editor's note - I read in this week's paper that there were shots between government forces and rebels outside of Goma, so it is always best to ask the people from the region!) In Kigali I met a Rwandan from Seattle who was importing tungsten from DRC through Rwanda for a contract with 'a man in NYC'. He also said it was safe, but admitted it was nicer to stay on the Rwandan side at night. And on my bus ride to see the gorillas I sat next to a really nice guy who it turned out was not Rwandan but a mechanic from Goma. He had traveled to Rwanda to fix a truck from his company that had broken down in Rwanda. He also convinced me I would be safe for me in Goma. So I decided to go for a day trip. Sadly I can't say I contributed much to the DRC economy as I only spent $32. I paid $30 at the border for my day visa. Lord knows where that money went! Then I hoped on the back of a motorcycle taxi for $1 to take me to 'centre ville'. The driver kept stopping to ask me in French where I wanted to go. I kept replying in my broken French, 'centre ville'. After a while he dropped me off at a round about. That's wen I realized that Goma didn't really have a town center. In a word, Goma is a dump. Part of the reason is that Nyiragongo volcano towering over the city. In 2002 it erupted and poured rough aa lava through town. I saw businesses like this furniture factory/store set up on top of the lava flows. I also saw a whole neighborhood being rebuilt with some large houses. I got the impression there was money in Goma. Like most distant border towns, there is always some trade going on, and in this case, I suspect most of it is illicit. I've read the rebels were strip mining tungsten and coltran (a mineral necessary for all our cell phones) from the nearby national parks to finance their efforts during the six year civil war that killed 4 million people. As the man from Seattle told me, there really is no functioning municipal government in Goma. So the roads that had been covered with lava were never repaved, making them quite bumpy and the town generally dusty. I was there just a couple of weeks before the run off in their first ever presidential elections. It was interesting to see all the campaign signs as well as locals wearing Kabila for President T-shirts. In hind sight, I wish I had spent money trying to buy a t-shirt. As I circled the round about deciding which way to walk, I all of a sudden heard someone yell "Tom!" I turned in time to see my mechanic friend crammed in a van with twenty other passengers most likely headed to work. Unfortunately he couldn't stop to chat, but it brought a big smile to my face. It was such a quintessential African moment, as the Africans I've met casually are so genuinely friendly and hospitable. I imagine I wasn't hard to spot as the only white person walking around! I did see a few other whites, but they were always driving a white Toyota Land Cruiser with some NGO logo on the side. And generally speaking, those NGO folks are rarely hospitable to tourists. As I walked back towards Rwanda realizing that I had exhausted the sights I wanted to see, I came across an internet cafe. I figured, 'when am I going to surf the net in the Congo again?' So I spend $1 to surf for an hour sending a couple 'guess where I am' emails over a very slow connection. What I did find amusing was the internet cafe had labeled each of the 20 work stations with the name of a US state. I was assigned the Missouri workstation (Texas was occupied). I thought, I doubt many American students could name 20 US states, and here the people of Goma are naming their internet cafe's worksta tions, of all things, after our states. (This might be because most African internet cafes also do a business filling in on-line US green card lottery applications for locals.) Nevertheless, that left me with hope for the country. Lord knows the nice common folk in the Democratic Republic of Congo deserve some peace, prosperity and good government after all those years of dictatorship and war. I hope they get it. In many ways Rwanda was a pleasant surprise - so unlike what I expected. Rwanda is the safest country I've been to so far in Africa. Rwanda is also the cleanest country I've been to in Africa. For example, they outlawed plastic bags, the plague of the African countryside as few African communities actually collect the trash. So instead of seeing blue plastic bags everywhere like I have from South Africa to Tanzania, Rwanda looked like I could have been driving in Europe somewhere. Rwanda also requires all citizens (except academics I'm told, who undoubtedly must have proposed the scheme) to spend half of that last Saturday of every month doing community service, such as picking up litter, planting trees or doing erosion control. The end result is a spotless countryside. Of course no amount of cleaning will remove the stain of genocide from Rwandan history. However the Rwandans all seem sincere when they say "there are no more Hutus or Tutsis, just Rwandans." The country is trying very hard to rebuild and "fight the mentality that let to the genocide" as I saw posted on public service signs across the countryside. I was told by an acquaintance at the US Embassy that Rwandans in general will not tell you what they are feeling and tend to keep their thoughts to themselves. He also said there is a bit of a police state that augments their tendency towards silence although I wouldn't have known this a a tourist (unlike Burma where you can tell everyone is scared to speak their minds). So for all I know the tensions will boil over again, but from what I saw and read, I doubt it. I certainly hope not and believe the average Rwandan hopes not, too. Immediately after walking into the friendly immigration, I found myself trying to figure out who was Hutu and who was Tutsi. Of course in doing so, I realized I was falling into the trap of separating instead of uniting the country, even if only in my mind. I also found myself subtracting 12 years from the ages of the people I met in order to try to ascertain what they might have seen or done from April - July 1994 during the genocide in which 800,000 to one million of the 1.5M Tutsis were killed (about 11% of the Rwandan population were killed in about 100 days). In time, though, I too was thankfully swept up by the positive momentum of the new Rwanda trying to heal itself and move forward. As a tourist destination, I can highly recommend Rwanda because it is basically the opposite of everything you probably imagine. It certainly was different than I expected after traveling for several months through Southern and Eastern Africa. Unlike its neighbors, Rwanda is clean. Kigali, the capital, is the only city where I've been able to walk around alone at night safely. The roads are very good. Kigali is relatively modern with glass skyscrapers and new cars. Much of that wealth and development is a result of returning Tutsis who left in the 1960s-80s. They return with capital and know how to build a new Rwanda. The injection of aid money driven by the West's collective guilt for having abandoned Rwanda in their time of need is also quite apparent. The main tourist attraction in this 'land of 1000 hills' is of course the mountain gorillas of Dian Fossey fame. I learned that consultants from the Wildlife Conservation Society out of the Bronx Zoo have suggested Rwanda focus on a high end tourism strategy. Consequently, the country has luxury facilities to offer up market tourists. (There was a sign at the park saying Bill Gates visited a few months prior.) The permit to see the mountain gorillas for one hour in Volcanoes National Park is $375, a small fortune in Africa. It was without a doubt the best wildlife experience I've had in Africa and worth every penny. I basically showed up at the appointed time in Kinigi, Northern Rwanda, and was put into a group with fellow hikers - Canadians, Americans, and Brits. I was surprised to see so few French tourists in this Francophone country. But I've since learned the Rwanda government has accused the French government of backing and arming the Hutu Power government before, during and after the genocide. So not many French tourists are visiting Rwanda at the moment. We went to see Group 13, a habituated group of gorillas who originally numbered (surprise) 13 but now are about 20. We only had to walk 10 minutes into the dense forest from where the park met the farmland to see the gorillas. It is hard to describe the experience of entering into their world with nothing separating the 2-5 meters between you and these wild yet very docile gorillas. It was clear that we were their guests and they tolerated us. As they looked into my eyes, I realized there were quite similar to us humans and must have been thinking something about me, making some sort of connection. At some level the tourists must be 'that harmless group of white and black creatures that show up everyday about this time and point those strange tools at us from their eyes'. The group had a 2.5 month old baby that was adorable, as well as two 20 month old half siblings who clowned around like kids. Sadly it is these infants that the poachers try to steal for private zoos. But because of the income and tourist draw that the gorillas represent, the Rwanda tourism authority guards the gorillas all day and haven't had a poaching incident in four years. The hour went by very quickly, and was well worth it. I would highly recommend the experience if you go to East Africa. You can also see some of the 700 wild mountain gorillas in Uganda and the Congo. Rwanda has the majority though and does a good job with them. I wouldn't venture into the Democratic Republic of Congo just yet to see the gorillas. Besides, Rwanda is much safer and more luxurious. On my way back from the gorillas I saw a 'gacaca' going on (pronounced ga-CHA-cha). As I learned at the International Criminal Tribunal for Rwanda in Arusha, Rwanda has many genocidaires in prisoned and living in communities not yet charged with a crime. It would apparently take over 100 years to get them all through the Rwanda courts. So Rwanda has re-created the gacaca system in order to disperse justice and achieve reconciliation by 2008. Gacaca is the traditional form of village justice in Rwanda. In this case, each village has elected five judges, which I saw sitting up front wearing sashes. The country has divided the criminals into three categories - those who planned or oversaw/lead the genocide, those who murdered or raped on orders from leaders, and those who stole but did not kill. Only the Rwandan courts and the ICTR can try the first group. The gacacas will try the second and third groups up to a maximum sentence of 20 years. The park guide I was with explained to me that the gacaca are as much about reconciliation as justice. For example, he said if his neighbor stole all his possessions and metal roofing during the genocide, then he and his neighbor would be brought in front of the gacaca similar to what we saw while driving down the road. There the neighbor would confess his crime and the details of his actions. You can imagine in the case of murder, this information is probably very important to the victim's family as they don't know what happened to their family member or where they were buried. As importantly, the victim would have to forgive publicly his neighbor. This includes murder victim's families forgiving the murderers. Then the judges would issue a penalty. My guide said in his example, he and his neighbor would have probably already agreed on a payment scheme which the judges would decree as the fine. In the lobby of 'the' Hotel Rwanda I met some Southern Californians on a social mission who had seen a gacaca in person the day before with a translator. (I was not allowed to stop or photograph the one I saw.) They said the accused was a prisoner wearing the standard light pink prison uniform like these I saw working on a building by the bus station in Kigali. (It was odd looking a several men acting as masons knowing between them they probably killed many, many innocent victims.) He stood next to the victim's family and confessed to killing two people with a hammer during the genocide. The Californians said that the accused said he was sorry, but they didn't feel he seemed very repentful about it. The families then forgave him. The judges sentenced him to time served (the 11 years he had been in prison without being charged or tried) plus 19 months community service. At some level it might seem like he got away with murder. On the other hand, like South Africa's truth and reconciliation process, Rwanda is dealing with justice and forgiveness in a traditional way at a village level in what seems to be accepted as fair by those involved. The Californians said it was interesting to see justice being dispensed efficiently and publicly given that many of the genocidaires have either been living without repercussions in their communities or have been locked up in prison for over 10 years without having been charged with any crimes. From the Rwandans I spoke to, they seemed to genuinely accept the process and welcome the closure in order to move forward. Of course, I'm not the one being asked to look at the man who killed my family with a hammer and forgive him so that the cycle of killing stops. The very good genocide museum in Kigali had a great quote by a victim of the Yugoslavia genocide that basically said, "If I take retribution on their children, then their grandchildren will take retribution on my grandchildren. The cycle has to stop somewhere." Perhaps only a victim of such horrors can find solace in building a new society, and in doing so provide an example to us all. I spent about six weeks criss-crossing Tanzania, which is one of the best places to see wildlife in Africa. I didn't set out to spend so much time there, but there is a lot to see and do. My first real stop after crossing into southwest Tanzania from Malawi was Zanzibar. Stone Town is historically significant as the hub of the East African slave trade by the Omani Arab sultan. (For the history of that see my chapter on www.TotoTravels.com.) Stone Town is interesting, but run down from Tanzania's failed attempt at Maoist socialism from the 1960s-80s when the government nationalized all the houses. They eventually figured out that the government, particularly a newly independent African corrupt government, isn't the best landlord when it comes to maintenance. Even more so when you realize that apparently there is no word for "maintenance" in Swahili. They re-privatized the properties in the late 1980s, and the owners have been renovating ever since. But I doubt Stone Town will ever be as it once was. The beaches of eastern Zanzibar are what you put on your screen saver - bright white sand and crystal clear turquoise water with plenty of tall palm trees to shade your hammock. I enjoyed the beaches and the scuba diving. After my failed attempt to enter Mozambique, I went to Mafia Island, just south of Zanzibar. Mafia was much slower and quieter with better diving in the marine park they established off shore. Although I preferred the beaches in Zanzibar for their brighter sand and clearer water for a beach vacation. In addition to Mt. Kilimanjaro which I've already written about, the other main draw to Tanzania is the famous national parks in the northwest. I was fortunate enough to see these as part of a luxurious National Geographic Expeditions trip. My business school friend, Nancy, founded a travel company that runs several adventure trips for alumni associations and NGE. One of my goals on this sabbatical has been to explore and evaluate whether I want to return to the world of communications software or perhaps go into the travel industry as I clearly love to travel. Nancy was kind enough to craft and internship of sorts for me as the assistant to the assistant tour leader on the NGE Tanzania-Zanzibar safari trip in September. It was a wonderful itinerary, group of clients and experience. The opportunity only made me more interested in the travel industry, although the jury is still out on what I will do when I return to the 'real world'. We had amazing safaris at three Tanzanian national parks. In Lake Manyara we saw the famous tree climbing lions as one lioness obliged by taking a cat nap in a tree (lions don't typically climb trees like leopards). In the Serengeti National Park we did not see the wildebeest migration as they had already left for the waters of Kenya. We did see lots of predators (leopards, cheetahs, lions, hyenas) feeding off the non-migratory zebra and wildebeest herds. Antelope, giraffes, buffalo, warthogs, baboons, hippos, crocodiles, elephants, birds, monkeys and many other animals graced us with their beauty. In the Ngorongoro Crater we saw these and one elusive black rhino. 99.5% of the 650,000 rhino that roamed Africa in the 1960s were sadly poached. I thought most were killed for their horns as an aphrodisiac in Asian medicine. Apparently most were killed to make ceremonial knife handles for Yemenis and Omanis awash with oil cash. As a National Geographic trip, we had access to experts funded by the National Geographic Society. One of the most interesting was to see the Olduvai gorge where Lewis and Mary Leakey discovered many stone age hominids and the famous 3.6 million year old Laetoli hominid footprint trail. As one of their colleagues, Professor Fidelis Masao showed us the site. He found a stone age tool used to crush animal bones and a fossilized hippo bone exposed by erosion just ten yards from where Mary Leakey discovered the Australopithecus Bosei skull in 1959. It was pretty cool holding a tool made two million years ago by a pre-homo sapiens hominid. Prof Masao also informed us that our evolutionary predecessors were not hunters and gatherers but scavengers. As they had not yet tamed fire, they actually would descend upon a kill after the other scavengers had left to eat the raw and rotting meat. Hence the need for stone tools to break open the bones to get to the marrow as the best meat was already taken by the predators. So all those pictures of cavemen cooking or hunting food are actually incorrect. They were eating stone age road kill scraps! I can highly recommend Tanzania for a safari you won't forget. The experts on our trip said Tanzania did a much better job of managing its wildlife than Kenya. So it is apparently the preferred destination for safaris. If you do go to Tanzania for a safari, I would recommend either adding a few days on the beach in Zanzibar or trekking with the mountain gorillas in Rwanda (more on that in a subsequent post). There are several lessons from this story. The first is that Miriam was wrong. The second is that I was wrong to go against my gut. I've learned the things I regret most in life are the times I don't listen to my gut. On Wednesday night I arrived in Dar Es Salaam airport after being an assistant tour leader for a National Geographic Expeditions trip in Tanzania (more on that great experience in a later post). I decide to purchase a one way ticket to Mtwara in the Southeast corner of Tanzania in order to over-land to Mozambique. My goal was to spend time relaxing on the beautiful Northern beaches of Mozambique. I applaud my spontaneity and frugality. I'm known for the later, but mocked by my friends for my lack of the former. Why buy a one way to Pemba, Mozambique for twice the cost when I can just get off the same plane in Mtwara and overland it? The first place I want to visit that is north of Pemba anyway. The next day I'm hanging out at my new friend sweet place in Dar. Mark works for the US Embassy - we met at the fish market in Zanzibar. His wife is back in the US about to give birth, so we become drinking buddies. I guess I found their home, the US cereal for breakfast, and the GE washer and dryer a bit too comfortable. Friday morning Mark is kind enough to take me to the airport for my 9am flight. I land in Mtwara and share a cab with a guy from the Cashew Board coming down to mediate a dispute between the growers here and the colluding buyers (This is a big cashew growing area - here is a photo of what they look like on a tree next to the Mozambique border post. I was chastised for taking this photo as the 'border' is a secure area. Unfortunately I have no other photos to prove to you that this collection of huts on a dirt road did not really need to be secured.) I go to the bus station and book a ticket with a man named Mossa on a 'bus' the next day to Kilambo on the border. At 4:45am I wake up as I haven't been sleeping anyway. Due to the electricity blackouts during the day, which is common throughout Tanzania due to a lack of rain for their hydroelectric plants, the carpenter a few yards from my bedroom window has decided to do all his power tool work at night. I can't really blame him as I would do the same. So after an evening of power saws and power sanders, I throw on my backpack and walk the 20 minutes in the dark to the bus station. Surprisingly, Mossa is actually waiting for me. He recognizes me, which isn't hard as I'm the only Mzungu (white person) there. Some 20 minutes later this Toyota Land Cruiser pulls up and I hop in the front seat crammed next to a nice guy who fortunately speaks some English. I strike up a conversation and provide some entertainment to my fellow passengers. We bounce around down a sandy, potholed road through some villages of thatch and mud huts shaded by palm trees. I watch the sun rise over the Indian Ocean and think, "This is going to be great." After an hour and a half, we arrive at this Tanzanian border post. The efficient Tanzanian immigration officer stamps my visa with an exit stamp. I amuse the local money changers by taking their pictures and letting them take pictures of me with my digital camera. Here is one of their better attempts. The first was just of my elbow. After 15 minutes the ten of us passengers crammed into the Land Cruiser are through Tanzanian immigration. We drive another 20 minutes to the Rovuma River, which forms the border with Mozambique. We unload the car. This ride from Mtwara to the river costs me $5. All of us (plus others waiting for a full boat to cross) load into this boat to cross the river. I have to say with all the people and luggage, the fiberglass boat was only floating a few inches above the water. Fortunately it is the dry season, so the river is only a few feet deep and the many sand bars would make for a safe refuge from the sinking boat. On the way, I snap this photo out of excitement to be en route to Mozambique. I ask the younger woman on the left first for permission. The old woman on the right then starts snapping at me in Swahili. Having experienced the wrath of many a woman, I realize she is upset with me, but everyone on the boat is laughing at her. I ask my English speaking friend what is the issue. He said she wants 500 shillings (about 40 cents) for the photo. At this time I realize she has beautiful tattoos on her face that I didn't see before. I offer to pay 1000 shillings if she will let me take another photo of them but with her smiling this time. She keeps complaining then counters with 2000. The guy next to me assures me that she is joking or she would have taken me up on my offer if she were serious. I don't pay her but don't get the smiling picture either. Chaos ensures on the Mozambique side of the river as two Chapas drivers compete for us as passengers. I sit tight following my new friend's lead as choosing the wrong truck will lead to an unnecessary delay waiting for the losing truck to fill up. The crowd tips for the pickup truck on the left, which is good as that is where my backpack ended up strapped under a pile of luggage on the cab's roof. By this time the only spot for me is squished between four other people literally hanging our legs off the back of the truck bed sitting on top of bags of produce. The hard part is always coming to accept your fate. The interesting thing is that once you accept the position you are in, you feel somewhat liberated. I cannot convey how sincerely friendly all the locals I met on this trip were to me. There were no trucks going back to the river. To keep me from having to walk the several miles, they convince a man to drive me on the back of his motorcycle for free. The truck driver asks me for money for my 15 minute ride and they tell him he is crazy and insist I don't pay. The driver backs down on his demand. So I put on my heavy backpack (I have sworn to send things home via post in Dar) and hop on the back of this motorcycle just waiting to topple off the back given my new center of gravity. We make it back to the Rovuma River where I give the man $5 for his trouble. He didn't ask and so is very happy with his windfall. After having nearly every kid beg for money in Africa, I am happy to pay this man. I load onto the same boat. My boat friends are happy to see me again. This doesn't prevent them from trying to charge me 8 times as much for the return trip. Fortunately my friend at the border who got me the motorcycle ride warned me that the price would be higher as they would be fewer passengers going back. I agree to pay what he said should be my top price - 15,000 shillings ($12) vs the 3000 I paid coming over. At this point I am waiting with the friends I made that morning (and never expected to see again) for a truck to fill up to take me back to Mtwara. As fate would have it, these white guys pull up in their very nice South African Toyota Land Cruisers (with AC!). I realize they are not South African, but German. I tell them in my best German that I lived in Dusseldorf. They ask me where I am from. I explain in German that "I am from Texas, but I don't like George Bush." They LOVE this and offer to give me a ride back to Mtwara as they can't cross in the ferry until Wednesday when the river is higher. The catch is that their trucks are packed to the ceiling with stuff since their caravan broke down on their two month trek across Southern Africa. They had already offered the one seat to a woman from the Tanzanian tax authority back to the border (always a good idea). So the only seat for me is on the tire on the roof! It was actually the most comfortable seat on the entire journey. I must add that it was the source of constant smiles and laughter all the way back to the border. The kids along the road thought it was hilarious. I felt like a king in a Mardi Gras parade! We get back to the Tanzanian border when I easily get a visa avoiding a perpetual stay in no-mans-land. However, the kind border official, who I also never expected to see again, informs me that I owe US $50 for a new visa. Thinking I might have better luck negotiating with this immigration offer I plead that I never really left Tanzania. I offer $20. We settle on $30. He then asks for a ride back to Mtwara with the Germans, so I spend the next hour in air conditioned comfort sitting twisted practically on his lap with the center console in the small of my back. Seven hours and $60 later, I arrive exactly where I started, at the Lutheran Center in room 3B for $8. I am looking forward to sleeping to the sound of power tools once again. Tomorrow I will get up at 5am again. This time I plan to take a bus to the Tanzanian beaches north of here. I've decided to give up on Mozambique for this trip. The Germans realized that the Mozambique embassy in Pretoria made a mistake on their visas. The dates have already expired. They are hoping they can reason with the man on the Mozambique side of the river to give them an extension as it wasn't their mistake. I told them not to get their hopes up. Instead I think they are going to send one of them up by bus to the high performance team in the Dar Es Salaam Mozambique embassy to get proper visa extensions. I told them to say hi to Miriam for me. On a continent full of poverty and despair, the School of St. Jude in Arusha, Tanzania stands out as a shining example of what is possible when a community puts its efforts behind a noble goal. In this case it is the Australian community supporting a woman with a dream to educate the poorest and the brightest as future Tanzanian leaders. Arusha is the launching point for most tourists to the Serengeti and Ngorongoro Crater national park safaris as well as Mt Kilimanjaro trekkers. I had a spare week between those two trips and was introduced to the School of St Jude by an Australian woman on my overland truck trip. Kim and her family joined ten other Aussies on a volunteer trip to build the desks for St Jude's new secondary school. They had heard about the school through Gemma, the energetic and unassuming founder and headmistress of St. Judes, on one of her fund raising tours at the Rotary Club in their town. What Gemma has accomplished in six years absolutely astounded me. Starting with just a plot of dirt, she has built a donor supported private elementary school that provides free education to 700 of the brightest students in Arusha. But here is the catch. They only accept the poorest of the poor. Kids with cement floors and glass windows need not apply. Through house visits (and having learned some things over the past six years Gemma told me), St Jude's ensures they are reaching those very poor. And let me tell you, these kids are smart and polite. They proved this by scoring the highest of any school on last year's regional exam. I had the pleasure of sitting in one and then teaching two computer classes so the very competent computer teachers could set up and network the new PCs they had purchased. The fact that these kids aced the test did not surprise me. I watched as the teacher explained to 3rd and 4th graders how to create a powerpoint title slide with each kid creating his or her own presentation on their favorite animal. Let's just say I've used powerpoint a lot in my career, and I have to admit I was learning some things. Possibly the most moving experience was on Friday when they had an open call for applicants for 20 spots in the first and second grade classes next year. They took me up on my offer to help them as they knew they would get many applicants. So I pull in at lunch to this sight - 2000 local children waiting to test for 20 spots. And this was just those invited back after a quick English skills screen of even more applicants earlier. (All of St Jude's classes are in English, reinforced by "Speak English" signs throughout the school). The applicants were well behaved, although you could see the anticipation and eagerness in their eyes. The school has learned to separate the applicants from their parents at the entrance lest they have a stampede. The first step was to have each applicant take a short language and math test in English and Swahili. These kids were so cute. As a proctor, I noticed some just sitting there politely not working on their tests. When I tried to ask why they weren't working, they kindly told me that they had no pencil with which to take the test! One adorable boy made me chuckle as he took off his shoes so he could count on his toes for one of the math questions! A couple kids caught cheating had their exams torn up and escorted back to their parents. St Judes has also learned that these kids respond to tough love. As harsh as it may have seemed to me at first, I realized they were right and I'm just a pushover. For example, those students lucky enough to be accepted are placed on one month's probation. If they don't perform in the first month, the school gives their spot to someone else. The opportunity is just too valuable to squander on a child who does not perform. I cannot say enough good things about this school. Each day I learned something new. For example, ala Hogwarts in Harry Potter, the children are placed into groups which is rewarded or penalized via a point system. Each month the winning group gets lolly pops (quite a treat when you are very poor). But the group is penalized two points for every wrapper found on the ground. If you've seen all the trash and plastic bags littering beautiful Africa, you will immediately see the brilliance in this simple system to teach these kids not to litter. Another example was when I walked into the impressive library. I expected spartan shelves in need of books. Instead I saw a library that equaled my elementary school in Houston. It turns out some man in America gathers donated English books. KLM ships them for free to Arusha for the school. I was so impressed that I decided to co-sponsor one of the children. All but eight of the 700 students are currently sponsored, but each year they add new classes requiring new sponsors. I say this only to let you know how impressed I was in case you are inspired to support them yourself. Gemma is building an upper school at this site (hence the desk construction), so the school will support 1300 students soon. She is also building a dormitory for 700 of those to be boarders. Realizing that the community could use more schools like this, she has raised funds to build a second school about 30 minutes away on 30 acres recently purchased thanks to a generous donor. If you are interested in supporting The School of St Jude, you can learn more about their needs on their web site. You can also contact their sponsorship coordinator about sponsoring a student. Co-sponsorship starts at US$380 up to the $1000 per year it costs to educate each of these special children. While in Arusha, Tanzania, I spent a morning visiting the fascinating UN International Criminal Tribunal for Rwanda. I didn't know what much to expect but was very glad I went. We saw two trials. One was the cross examination of a witness by a Canadian defense counsel. The witness was protected by a curtain and the attorneys were also advised not to mention his exact profession in order to protect his identity. Although we did learn he was chief of police and that he only had six years of primary school education. It was impossible to tell how he fit into the year long case with only one hour of testamony. The trial had already taken over 200 days in court. I was impressed by the defense counsel petitioning the three international judges at the end of the testimony to try to do something about the fact that these Rwandan witnesses were coming to Tanzania to testify yet had been held without trial for over ten years in Rwandan jails. He made an eloquent argument that the ICTR was supposed to be a role model of justice and human rights for the world and here it was relying on witnesses who had been held without charges for ten years. The prosecutor argued that this was not the forum for such pleas, which I tended to disagree with. The Sri Lankan judge noted the comment and recessed until next week. Unfortunately, I got the impression the UN ICTR will not do anything about this issue. Even more sadly, I used to think the US was a role model of a proper system of justice to the world. However, the Bush administration is no different from the current Rwandan government on this issue, as I think it wrong that we have also held people without trial for years. The second trial we saw was the prosecutor questioning Sylvain Nsabimana, the Prefect of Butare, who is charged with genocide in a joint trial. It was interesting to sit only two yards away behind glass from this man and listen to his testimony. He is certainly innocent until proven guilty. However, I suspect he must have seen some awful things back in April 1994, which the prosecutor was trying to get him to recall. It was interesting to hear testimony about events that happened 12 years ago. The wheels of justice certainly move slowly! The other thing that struck me was how they ICTR classified the trials in the hand outs listing all the sixty plus accused. They grouped them into these categories: political leaders, military leaders, senior government administrators, media, and religious leaders. The later was a sobering example of just how awful this genocide was. A rector of a college, a military chaplain, and a Catholic priest all stand indicted. A Seventh Day Adventist minister and his son, who incidentally were arrested in Texas in 1996, were sentenced to 10 years in 2003. Ramsey Clark of the USA, who is currently the public defender for Saddam Hussein was, their counsel. All this to say that I was glad to have spent a morning seeing this effort by the international community to bring the perpetrators of the horrible genocide to justice. The multi-year trial employs hundreds of people in Arusha, Tanzania and must be a big boon to the local economy. I certainly recommend a visit to the tribunal if you find yourself in Arusha before the ICTR is scheduled to complete by 2010.